Some baseball and softball pitchers have their careers end because of an injury. 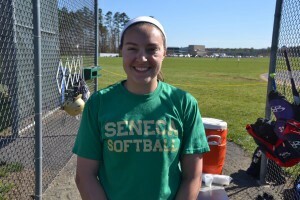 Seneca High School softball junior pitcher Eliza Sweet’s career began following an injury. Nearly 10 years later, Sweet is the ace for Seneca. Her pinpoint command and arsenal of pitches helped her strike out more than 100 hitters last season and pitch back-to-back shutouts in the 2015 South Jersey Group III tournament for Seneca. As a sophomore in 2015, she was one of four pitchers named to the All-Olympic Conference first team. Sweet’s success can be attributed to her command and ability to throw strikes. In Sweet’s first five starts of 2016, she walked just five batters and struck out 25, despite pitching almost every inning for the Golden Eagles in those games. Sweet’s command didn’t develop overnight. She began learning to pitch at Indian Mills softball at a clinic softball director Kim Albertson ran. It took Sweet about two to three years from when she started pitching just to consistently throw flat fastballs over the plate for strikes. From there, it took an additional two to three years to learn how to consistently throw well-placed moving pitches. Today, Sweet has two pitching coaches. One is Tom Besser from Elite Fastpitch Inc. The other is Stacy Jackson, Sweet’s coach with her travel team, South Jersey Mystics. Sweet credited both of them with helping her become the pitcher she is today. Sweet’s ability to control pitches isn’t due to anything she does differently with her mechanics compared to other high school pitchers. Sweet can throw a variety of moving pitches, including multiple variations of a curveball and screwball. Sweet places her curveball in different locations based on the batter’s count. Sweet uses her screwball to help keep hitters off balance. The one area where Sweet is focused on improving is finishing strikeouts. Sweet is only a little more than halfway through her high school career, but she already knows where she is going to college. She plans to attend The College of New Jersey beginning in the fall of 2017. Moving forward in 2016, Sweet is hopeful Seneca can make a deep playoff run. The Golden Eagles started the season with a 4–2 record. Sweet’s pitching has kept Seneca competitive in most of their games.